My first Mozilla event for the year 2014 started with the Firefox OS AppDay workshop organized by the Computer Society of India student branch at TocH Institute of Science & Technology (TIST), Arakkunnam, Ernakulam as part of the FOSS Day celebrations. 4 Mozillians from the Mozilla Kerala community gave leadership to the workshop. Praveen Sridhar was the team-lead and chief guest of the day. 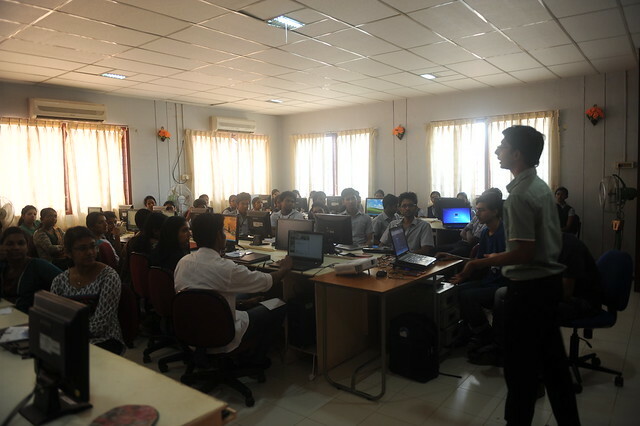 I started off the session with some basic introductions to Mozilla, Mozilla Kerala and it’s activities. Kumaresan CS then gave a brief introduction to the Webmaker Project and the new MDN, with live demonstration of the websites. After that, Praveen took up control and started with the official course of the event – the real app development workshop. From the poll we took in the introductory session, we had realized that most of the participants weren’t any experienced in HTML, let alone HTML5. So, he decided to give them some basic demo template app to play with. After the demo of the template app, we broke for lunch. The team had a little discussion over lunch and decided that what was actually required was to teach the participants HTML first and then move onto Firefox OS. I had suggested to start from the skeleton of HTML and then move onto the structure of App Development of Firefox OS. We finalized to start from scratch and then move on to actually make apps. In the afternoon session, Anush (bmx) took up control and started with the skeleton of HTML programming and CSS styles. We taught them how to create their first ‘Hello World’ pages, and then went on to show them how to use CSS styles to design their pages. Once we were done with teaching the basics of HTML and CSS, we gave them 15 minute to make something of their own. Once they were familiar on how to design their own webpages, we gave them the most important information for the day – how to make their ‘manifest.webapp’ file. Once that was done, it was time for Firefox OS Apps. Now was the time that the AppDay actually started; The participants started making web apps for Firefox OS. Though we couldn’t get any complete Firefox OS apps that were ready for the Firefox Marketplace, we did get the participants excited and enthusiastic to develop for Firefox OS. I think that itself can be considered as the success of the event. We believe that the enthusiasm that the participants showed will be transformed into Firefox OS Apps after the event.